Thousands of origami doves have been installed at Salisbury Cathedral to signify peace following the nerve agent attack in the city. 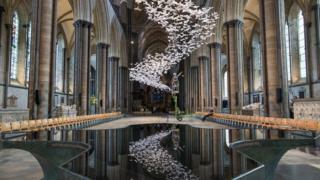 The installation comprises 2,500 messages folded into bird shapes suspended along the length of the nave. The city's community groups have also been encouraged to contribute their own thoughts and fold their own doves. Artist Michael Pendry said: "In their unity they stand for a fundamental human right to peace and freedom." Image caption The work is entitled "Les Colombes", which is French for "the doves"
Image caption Exhibited in Munich, Jerusalem, London, San Francisco and Berlin, Mr Pendry said he wants the flock to "grow, from place to place, from country to country, and across all borders"
The installation has been organised in the wake of the poisoning of the former Russian spy Sergei Skripal and his daughter Yulia in the city in March. The pair were discovered unconscious on a bench in the city centre after being exposed to the toxic nerve agent Novichok. Since then, the city has seen a fall in visitor numbers and revenue and traders have been hit by a drop in sales. Image caption A community project has also been launched where paper doves will be made and displayed in windows across the city to show its "resilience in response to the nerve agent attack"
Les Colombes has been exhibited in Munich, Jerusalem, London, San Francisco and Berlin. At each location Mr Pendry encourages community groups and individuals to fold their own doves, which he then includes in future installations. "Although the doves are folded by different people in their unity they stand for a fundamental human right - the right to peace and freedom," he said. "May the flock of doves grow, from place to place, from country to country, and across all borders." Will Salisbury ever recover from the Skripal poisoning?